The Eastside is the historic core of Santa Fe. It is characterized by authentic adobe homes, many being over 100 years old, nestled along narrow and winding streets. A charming area, it is lush in summer with many shade trees and hidden gardens behind adobe walls. Find a small pieds-a-terre or a spacious estate in this area with old world ambiance. It is here in the eastside where many of Santa Fe’s renowned galleries, restaurants, and museums are found. The Eastside also extends into the foothills behind St. John’s College. Homes in this area are built on one to five acres with very hilly topography. Many properties have views to the Rio Grande Valley and are surrounded by mature juniper and pinon trees. Wilderness Gate, Ponderosa Ridge, the Museum District, Gonzales Road, and Upper Canyon Road. Plaza Chamisal, Los Miradores, The Compound, Acequia Compound, Las Vistas, Magdelena Compound, and Las Puertas. Just north and east of the plaza 5-10 minutes are the rolling pinon covered hills of Santa Fe’s Northside. Lots tend to be 1-2 acres in size. Terrific views of the Sangre de Cristos and over the City are common. Around the Governor’s mansion area, many homes were built in the 1960 -1980 period and may be dated. Others have been renovated to today’s elegant standards. On the prime view sites, luxury estates, characterized by amazing sites and the finest of finishes, are found in the $2,000,000+ range. The Governor’s Mansion area, Circle Drive, Brownell Holland, Sirerra del Norte, Los ceros Colorados and the Summit. Close to the Santa Fe Plaza, this area is a blend of neighborhoods built in the 1940s to the 1960s, as well as some of Santa Fe’s newest homes. Older homes, between 1,500 to 2,000 square feet, sell from $325,000 to $600,00. New homes of the same size sell from $500,000 to $1,000,000. Neighborhoods with new homes tend to enjoy city and mountain views and to have larger lots. The Westside is characterized by small homes (1,400 to 1,800 square feet) on lots of 4,000 square feet. Most of these homes were built within the last 50 years. Prices range from the high $100,000s (for homes that need updating) to the mid $500,000s for newly renovated homes. Agua Fria Street, Franklin Street, Kathryn Street, Alto Street, Closson Street, and Alarid. A condominium community within this area is Pueblo Alegre. Southeast of Santa Fe’s Plaza you will find a mix of older neighborhoods (built at the turn of the last century) and homes and condominiums built since the 1970s. Prices range from $400,000 to over $1 million. Sol y Lomas, the South Capital District, De Vargas Heights, the Zia Road Corridor, the Old Santa Fe Trail Corridor, Las Venturas, and Cloudstone Drive. Quail Run and San Sebastian Condominiums. Most of Santa Fe’s growth has occurred in the Southwest side since the 1970s. Neighborhoods in this area were built by large developers on lots ranging in size between 5,000 and 10,000 square feet. The Southwest side is convenient to shopping malls, St. Vincent Hospital, and most medical offices. Bellamah, Las Estacias, Rancho Viejo, Tierra Contenta, Las Acequias, and Casa Alegre. Vista de Zia , Tierra de Vista, and Park Plazas. Santa Fe County is vast and varied, characterized by many microenvironments. Fifteen minutes west of Downtown Santa Fe is Las Campanas, an internationally known golf and equestrian community developed by Lyle Anderson. Everything about Las Campanas speaks quality – from its 2 Jack Nicolas golf courses, fabulous spa and tennis facility, and dining venues. Outstanding homes and town homes with spectacular views are available from $550,000 to $8 million. One acre + lots are available from the $100,000’s to $1,000,000 +. Arroyo Hondo is known for its level terrain and open meadows – perfect for horse owners. Lots tend to be at least five acres in size. 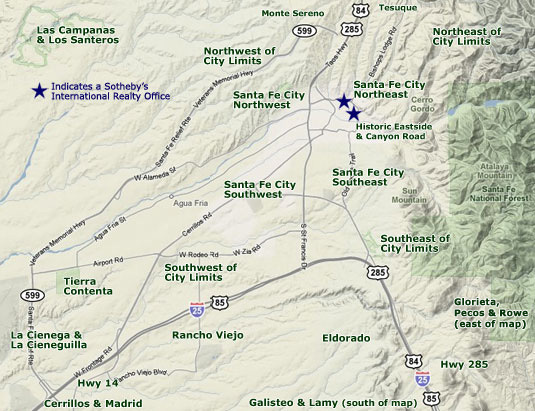 Arroyo Hondo is ten minutes from down town Santa Fe, with great southern and western views. The Old Las Vegas Trail Corridor is just east of Arroyo Hondo and in the foothills. Pinon and juniper cover is thicker than Arroyo Hondo, and many hills have dramatic rock outcroppings. Lots range in size from 2.5 to 10 acres. Fifteen minutes south of Santa Fe, El Dorado is a satellite community to Santa Fe, with its own elementary school, a small shopping center, and a self-contained water system. Laid out along various green belts, houses look over the open grasslands of the ranch from which it was carved. There are mountain views in all directions, including the Jemez Mountains, the Sangre de Cristos, and the Ortiz Mountains. Clustered around El Dorado are smaller subdivisions with lots ranging in size from 2.5 to 5 acre. These include East Ranch, The Ridges, Tierra Sabrosa, and Old Road Ranch. These two villages are old and picturesque. Lamy (named for the first archbishop of Santa Fe) was the closest stop on the old Santa Fe Railway to Santa Fe itself. Today, trains stop at the old depot, around which are clustered a handful of homes. Galisteo is fifteen minutes farther south of Lamy. An old Hispanic village, set along the Galisteo River, Galisteo reflects old-world adobe charm. Surrounding ranch lands recall the days of the Wild West. In fact, many Westerns and films with more contemporary themes are filmed in the Galisteo area.